I present to you the new Crowdfunding Collection #44, which includes every tabletop project started between 20.06 till 26.06. Within this collection you’ll find three projects from Germany that don’t require any foreign language knowledge. Two of those should be of interest for those creating dungeons whether its laying out tiles or printing buildings, the third is a poker deck that did impress me. Next to those you’ll find a fresh role-playing take on the story „The Yellow King“, a project celebrating the 90ties and the newest gamebook by Ryan North. DSA is about to get its first English supplement and there are tons of cool adventures, dice and other project. The list has one of the rare dutch tabletop Kickstarters, aiming to translate „No, Thank you Evil“ by Monte Cook and a fascinating french „Beer & Pretzel“ RPG. The project promises various tiles as described, that are able to be linked to create a floor plan. Next to that it aims at creating objects that might be used to decorate the floor plan further. The tiles are quite solid and wipeable, enabling to you to make notes. The object range from loot to furniture and will stick once placed. Though they might as well be removed. From my perspective the concept does look quite handy, has a cool design and is quite affordable. It offers a basic box at €29 which includes about 250 pieces. Of those 100 are classic tiles, 160 are various objects and you’ll get 2 inventory tiles. The complete set with about 500 elements is available at €49. Offering 200 classic tiles, 320 objects and 5 inventory tiles. It is one of the few „tile and terrain projects“ where I myself feel tempted to back it. Thus I do give it a heartily recommendation. The projects offers backer files for various terrain objects to be printed. For which a backer will need a 3D printer. I think the idea is reasonable and the creators are quite experienced. Attracting more than 100 backers so far. I do recommend having a look, that is if you’ve got a 3D printer. While playing cards are used within some role-playing games I tend to not care about them at all. Yet, thanks to the fact it’s located in Germany, I gave it a chance. I do like the design of the cards, their look, the fact the cards are durable and water resistant. Next to the general idea of having a travel set. The sets do come in three colors and are in essence a normal poker deck. The price is, at least in my opinion, quite reasonable. Hence I did back it and do recommend the project. As suggested by the title the game focuses on the mythos introduced by the popular short story anthology „The Yellow King“ by Robert W. Chambers. The game uses a new edition of the Gumshoe System, which will be provided with its first book.
) Paris, set during the Belle Epoque. The player characters are american art students delving into the Absinth soaked demimonde. Being confronted with mysteries involving Gargyles, Vampires and other creatures.
) The Wars, set into a big, European conflict in 1947. The player will assume the roles of bogged down soldiers who will struggle to stay alive in a weird and eerie battlefield that offers supernatural mysteries and occult machinations.
) Aftermath, set in North America 2017 as an aftermath to the war. An insurrection toppled the dictatorial regime and the player will assume the role of former partisans. Adjusting to the new life, building a society on the ruins of the civil war and confronting the idea that not all monsters might be banished.
) This is the new normal now, is set in contemporary 2017 as we know it. The world is only subtly permeated by supernatural beings and maddening reality conflicts and the player might assume the role of ordinary people banding together, getting a glimpse of their past lives, and ending the menace once and for all. The setting is not only extensive, but will see the release of a supplement Absinthe in Carcosa, detailing the Paris in 1895 in a player facing fashion. The creator Pelgrane Press is quite experienced in the handling of Kickstarter Projects as well as creating of role-playing games (both proven by „The Dracula Dossier„) as is Robin D. Laws. While I am usually not such a big fan of all things Cthulhu I am very intrigued by this project. Enough to actually straight up back it. I do very much recommend having a look at the project and to consider it. The newest project by Hannah Shaffner addresses the lifestyle of the 90ties, the love for music and for classic record stores. The players to assume the roles of characters in line with movies like „Empire Records“ or „Clerks“. The game system used is Questlandia and the playing experienced should be along the line of a story game. Hannah did create other games based on the system before, like Noirlandia. A project I did gladly partake in. I feel a little bit tempted to back this one, yet I am to young (’80) to have lived through this specific timeline and don’t harbor nostalgia for the period. Yet I do still fondly recommend the project. This is the newest project by Ryan North, author of game books like To Be Or Not To Be as well as Romeo and/or Juliet. Making another gamebook based on English literature. I did took in the Kickstarter project of „To Be Or Not To Be“ and way very satisfied with the quality of the product and handling of the project. As I like the idea of a shark punching Shakespeare I am yet again on board and recommend the project to you. The project aims to finance the translation of the tabletop rpg „No, Thank you Evil“ by Monte Cook into Dutch. I do hope they’ll make it. The game is a new, french tabletop rpg by Casus Belli and Black Book Editions. The game claims to be „Powered by the Apérocalypse“ (Schnapps-O-calypse) and the player assume the role of Raôuls. 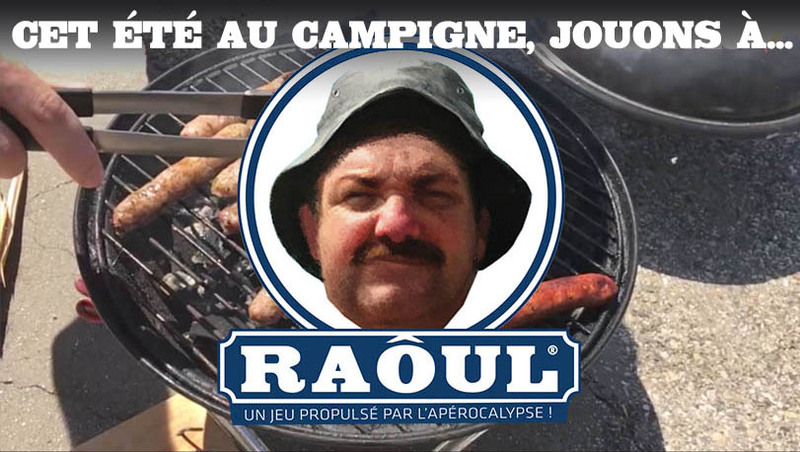 Raôuls are a certain kind of person, drinking beer, eating sausage, sporting a schnauzer and wearing stuff like colorful, bit to tight t-shirts and strange hats. Owning something like a big but old BMW and being somewhat provincial. Reminding me of days of my youth when comedy movies like „Manta, Manta“ or „Werner – Beinhart“ were a thing. The whole project banks in on the comedy aspect of the idea and stretching the boundaries of taste by using the dreaded Comic Sans font a lot – a novelty for a French tabletop RPG project, which are usually more fancy. I personally love the idea and style. It genuinely amuses me and I do recommend you to have a look at this Beer & Pretzel (well or rather Aperol & Baguette?) game. The crowdfunding spans only 7 days in total, so if your interested you shouldn’t wait to long on it. The project aims to finance the third entry to a series of books based on a fantasy tabletop rpg campaign the author played. I’m Hal Burdick of Invader Films. My two passions are filmmaking and gaming. Gaming came first, films came second. Invader Films efforts have been to blend what we think is cool about gaming with what we think is cool about filmmaking. For the bulk of those efforts, it has been about making films inspired by games. This time around we’re making a game inspired by horror films. We call it Graphic RPG. We’d love for you to write a review of the game or talk about the game on a podcast. Would you like to Skype in and play a session with us to get the gist? We would send you a free copy of the rules, but they are still in note form and won’t be made ready for publication unless the Kickstarter funds. As game makers, we have successfully produced an RPG for kids called Atlas Kings. As filmmakers, we have produced three feature films (Voidfinder, Lights Out Rowan, and Neptune and Me), a web series (The Dangers of Daggermore), and several short films (The Drow Ballet, Newlywebbed, and 67 Fortunato). I Hal, I am sorry for the delayed reply. At first I was kind of occupied and than I caught a quite mean cold (where I still have a small aftermath going on). In general thank you for contacting me. I did include your RPG and it is currently first in the „Urban Action“ category. I am currently finalizing the next collection, though I doubt I’ll find time for the blurbs. There are like 14 tabletop core-book projects out there, and am not that well. I will likely as well lack the time to read a longer text, play or do a formal interview. Though you can contact me at hfuss@rz-online.de, teylec@gmail.com or in Skype via my nick Teylgran, my ICQ # is 6366123.